QuestionCan your pet tell that you're high? It's not hard to figure out if someone is high. If you hung out with someone every day, went on walks together, or just lounged on the couch watching Netflix with them a bunch, the likelihood that they’d be able to tell whether you were stoned would be pretty high. And what if that person was your pet? Does your dog or cat know what's going on when you start raiding the fridge and cupboards? Hopes&Fears reached out to people who know animals best. In addition to any differences in your behavior when you are intoxicated or high, dogs would be able to pick up on changes in your smell. 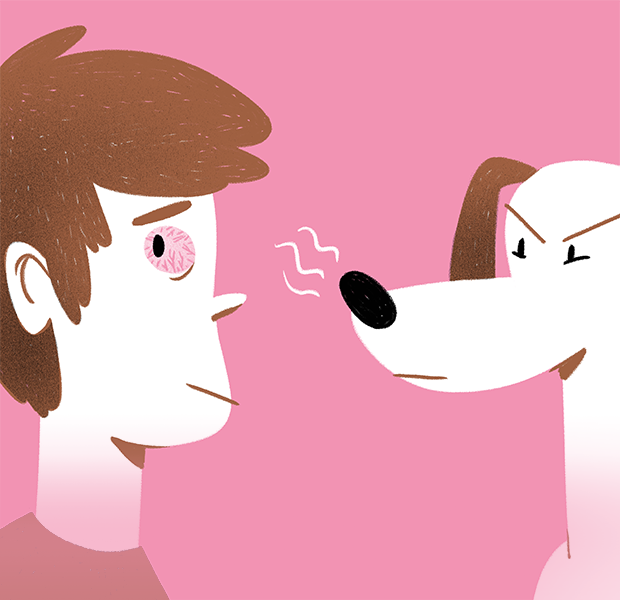 Indeed, dogs can be trained to "tell us" if they encounter an individual who's "high." Even if the smell is not noticeable to another human, a dog's sense of smell is tens of thousands of times as sensitive to odors as yours. One of the most impressive examples of this are dogs that are trained to detect when their owners' blood sugar levels are low. Debby Kay trains diabetes detection dogs—dogs that can use your breath to detect your sugar levels. As part of the training, her dogs learn to tell their owners (called "indicate") when they need insulin. In some cases, the dogs are better indicators than other monitors. While your own dog would need to be trained to indicate to you that they know you are “high," chances are very good they can smell the difference. is an active chemical compound produced in Catnip. Indeed, police breathalyzers could be replaced with dogs, and could even be used to detect individuals who are high on other drugs. One of the problems here, however, is that it's very important to be sure the dog is trained correctly. The issue of using dogs to detect drugs, for example, has been called in to question. In some cases, the dogs have been shown to "indicate" that there were drugs when the handler thought there were drugs, but no drugs were present. Service dogs clearly want to please humans, and they pay very close attention to how we behave. There is a famous, classic case of Clever Hans, a horse that could count, which explains why this is a problem. If you asked Clever Hans what 2 + 3 was, he would stomp five times. Scientist came from all over to study Clever Hans. First, they thought the trainer was "cueing" him to the correct answer, so they tested Hans when the trainer was not in the room. Hans would still get the answer correct, even if a stranger was in the room giving him the math problem. As it turns out, what Hans was doing was not counting, but pretty amazing just the same. He was paying careful attention to the person in the room! When he would get to the right number of "stomps," the person was likely changing their behavior every so slightly (ah ha, this is the right number, is Hans going to stop stomping? ), and Hans would pick up on their behavior. In the end, when the person in the room didn't know the question, Hans did not get the answer correct. The lesson to be learned from this example for training dogs to detect drugs (or individuals that are high) is that it takes a knowledgeable trainer to be sure a dog is indicating what you're looking for, not what you're expecting! Dogs living in states where medical marijuana is legalized are more likely to be taken to the vet for Marijuana toxicosis. Dogs and cats are proficient mind-readers. They pick up our facial expressions, body postures, moods, and emotions. This is even more intense when they know us well. And they certainly pick up on changes and mood shifts very quickly. Because they, unlike us, are always watching. We could learn a lot about communication by learning to be half as attuned to our environment as they are. Dogs and cats are smart and intuitive, especially when it comes to the emotional states of their loved ones. As anyone who's shared their home with a dog or cat knows, animal companions respond when we're happy or sad, depressed or excited. PETA recommends returning the favor by protecting animals from secondhand smoke of any kind. Take the smoke into the next room or out of the house entirely, as strong doses of marijuana can be dangerous or even lethal to a dog or cat. Dogs are able to sense the direction of your gaze, and now they’ve discovered that there is something in that direction. If you were behaving in an erratic manner, it would probably be sensed by dogs, but not by cats most likely. These animals have been selectively bred to be dependent. Wolves are able to make much more independent decisions, while domesticated dogs tend to wait for direction from an owner–though in that way they’re much more socially intelligent. According to a 2012 survey, more households own dogs than cats.